I’m no nationalist. I have no stake in the entire debate around the Acts of Union of 1706 and 1707: as long as Scots and I can be pals and visit one another’s countries, I’d be happy. 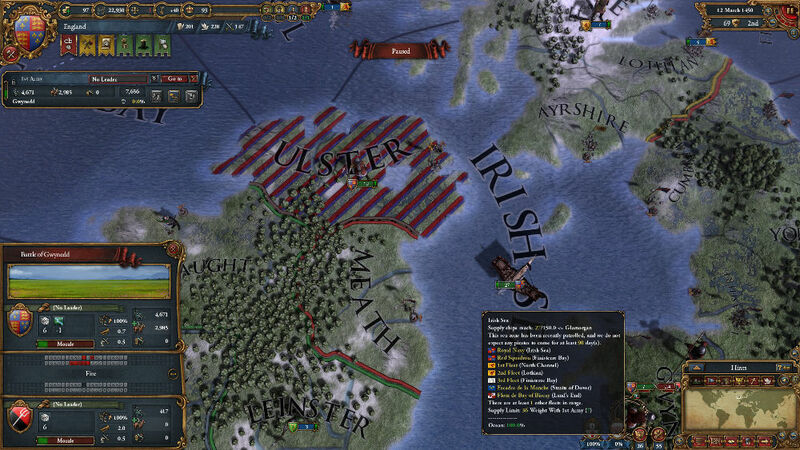 The bizarre thing about Europa Universalis IV in light of this is that I feel, when playing as England, an insatiable urge to create the United Kingdom of Great Britain and Northern Ireland comes over me that I align all of my efforts towards satiating. Whether it is about controlling what can be argued , or whether it is about a desire to have a unifying colour scheme for the game’s political map is something I’m not sure of, but there is something so wonderfully satisfying about being able to set one’s own goals and being able to use one’s capabilities to work towards them, whether these be simple short-term goals or long-term battles of attrition. EU4‘s interface is a thing of beauty. This sort of self-direction is the bread and butter of Europa Universalis IV‘s experience: pick a time frame, pick a nation, select your difficulty and the way that historical contingencies will unfold and you’re away. The world map is yours to do with as you see fit, with whichever means you see fit. From diplomatic to administrative to mercantile to military means, and with a number of substrategies within each of these general means and any combination of them, there are an innumerable amount of things to aim for within the game and ways to go about doing them. 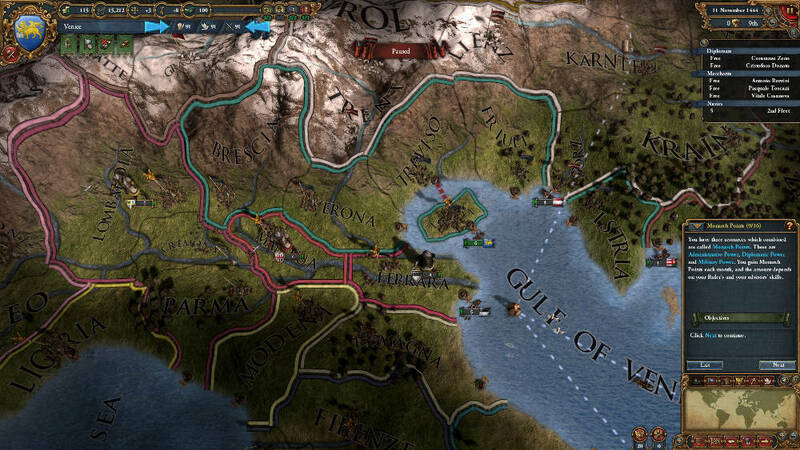 The lack of macro-level direction provided by the game may be somewhat of a shock to those new to the ethos of Paradox’s grand strategy games: though there are (generally) short-term missions, such as establishing a royal marriage between your state and another, available to direct play in exchange for rewards of diplomatic, administrative and military capital, there is no set victory condition. The game is finished once you’ve achieved your own objectives; the game serves as a sandbox for the fulfillment of one’s own armchair general dreams. The game is hideously deep, and does a wonderful job in hiding its true complexity behind a gorgeous interface: the multitude of options that one can set for their state is hidden behind one tabbed menu, whichever aspect of the game one is focussing on at any one time can be displayed exclusively through the selection of map modes available, each presenting a unique perspective on what is happening within one’s surrounds. Even without a complete understanding of the minutiae of all of the mechanics of the game, it’s more than possible to manipulate things to one’s advantage. Knowledge, as in life, comes with experience and the ability to leverage one’s knowledge to one’s advantage scales with time invested in the game. The way that the game can bait you to stop paying attention to the domestic when dealing with one’s foreign campaigns, whether these be diplomatic or military ones, is testament to the depth of thought that has clearly gone into its design. Spend too much time fighting abroad without popping back to your own provinces and you’re likely looking at a set of people being less than happy with your rule and setting up their own little rebel camps; spend too long expanding your territories into previously foreign territories and your tax take is likely to decrease below its theoretical maximum owing to your rule being overextended. 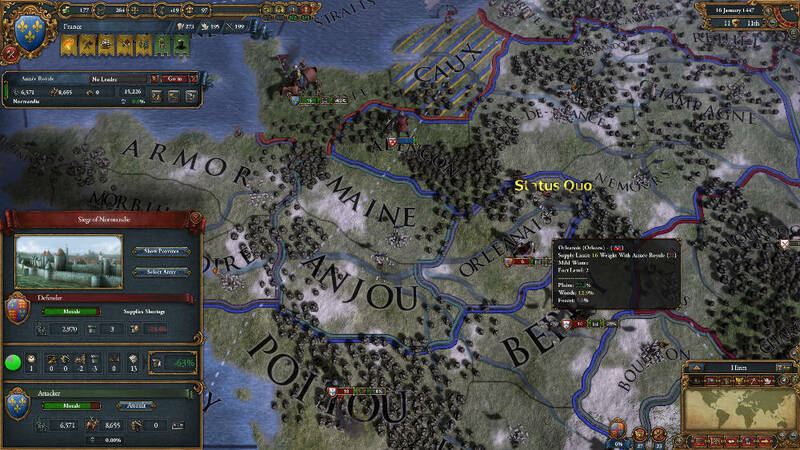 Europa Universalis IV is a game that expects you to monitor both the macro- and micro-level processes that constitute the game’s mechanics and doesn’t necessarily expect you to do a good job at doing so. The random events that the game will throw at a player seem testament to this, and prevent the experience of the game becoming an exercise in complacency once the basic mechanics and understood. Much has been said of the depth of the game, and indeed those comments are justified. As much heed should be paid, however, to the efforts that Paradox have made to make the game more accessible than the likes of Hearts of Iron III and Victoria II. The tutorial offered by the game, when combined with the context-sensitive hints that pop-up in game, provide a great degree of insight into the core mechanics and why certain elements matter (the big one being “why does the Papal State matter?”) without deviating from the organic learning of picking things up through play. It’s a monster, but significant efforts have been made to show its weak spots before making the player fight with it. Playing on the other side of conflicts can offer strategic insight for future engagement. The chief point that should be made about Europa Universalis IV is that it is not a game that can be played casually at all. In order for any competence to be gained in navigating the myriad menus and dealing with tactical scenarios within the strategic context of player-set goals. Any determination expended on the game, however, is rewarded handsomely over time: more ambitious goals can be chased, amount of time taken to achieve any goals can be reduced dramatically. There is such potential for variety in deciding goals and methods of getting there that there is no hard limit of the game’s replayability. The cliché of something being limited only by the “imagination of the player” holds true here, for once. While the game is not for people who don’t have the time to invest in a complex strategy game, those of the time and inclination to really delve into a set of rules and gain a deep understanding of them, Europa Universalis IV is something that just keeps on giving into far-too-long nights spent clicking just trying to quell those bastards in Fife that just won’t accept vassalisation. Nothing’s changed in 600 years, it seems. Disclosure: This review was based upon review code issued by Paradox. I’m happy to evangelise for a company whose products are consistently fantastic.